How to Check or Find MAC Address on Linux Mint? There are two methods to find your current MAC Address: First you can know MAC Address using ifconfig; Second you can find mac address linux without ifconfig. What is MAC Adress ? If you are connected to the network (both for local or internet) using cable you certainly have a device called NIC (Network Interface Card). And if you are connected using Wi-Fi device you also have the Wi-Fi device. Every NIC has a hardware address that's known as a MAC, for Media Access Control. Where IP addresses are associated with TCP/IP (networking software), MAC addresses are linked to the hardware of network adapters. A MAC address is given to a network adapter when it is manufactured. It is hardwired or hard-coded onto your computer's network interface card (NIC) and is unique to it. Something called the ARP (Address Resolution Protocol) translates an IP address into a MAC address. The ARP is like a passport that takes data from an IP address through an actual piece of computer hardware. Once again, that's hardware and software working together, IP addresses and MAC addresses working together. The eth0 is NIC (Network Interface Card) when your computer connected to a local network using a RJ-45 connector cable type. For my result above is inactive because i am using a Wi-Fi connection. The wlan0 show the MAC address used by Wi-Fi device. This is my current MAC address and you can show there is number n RX packets. Now we will check MAC address without ifconfig. ethtool is an alternative Linux apps for ifconfig, and you need to install it first to use. How to run ethtool to know MAC address? You have to decide where device that MAC address number you want to know; Is your NIC card or Wi-Fi device ? Or type ethtool -wlan0 in order to know the MAC address for the Wi-Fi device. That is very simple! Try to see that picture above you will see the same result of the MAC address from different MAC retrieval method. How to Turn Off / Disable Automatic Updates Linux Mint when computer start? Turning off automatic update on Linux Mint can be easily done with GUI mode using "Startup Application"
When you are working on 3G connection or slower speed, automatic system update which performed automatically by the system may cause spent many data usage. Also if you do not satisfy with automatic update you can disable the automatic update so when computer start your system will not check any new update from the internet. And for some reason, another people love the automatic update to get notified of updates, particularly security updates. That is your choice if you want turn off Linux automatic update or not! If you believe it's important to stay up to date with the latest security patches, then you should keep it enabled! Again, for some reason you want to re-enabled your automatic update for your Linux Mint, you only need to make it active/enabled. Go to your Start Menu >> Preferences >> Startup Applications and make the "mintUpdate" position to "ON". Please note that by turning off automatic update you will not receive any notification update for the system also applications. By using this "Startup Applications" you can also manage startup application on Linux Mint. Disable all unwanted program to make your Linux Mint faster. Here are the Complete Ways to Install Software/ Application/ Program on Linux Mint. Linux has several installer file or package which can be installed and used by user, such as zip, tar.gz, deb, jar, and soon. Please make sure the zipped file contain an executable program for Linux, not only a packed file. For an example click how to install Office Word 2010 Theme on LibreOffice, you will get a zip file. This type of file is only zipped file, not an executable file. You need to follow the instruction to install the file. If the type of zip file is an exetubale file, you need to double click the executable file twice to run the program. There is no short cot listed on the Start Menu but you can add it manually. tar.gz file is a packed file which has the same behavior to zip file. To install tar.gz file on Linux, first you need to download the tar.gz file (For an example see how to install Light Table); unpack the archive; and click it twice to execute the program. And finish the application installed, you may create a short cut for your apps. You can install Linux apps such as install program on Windows if you choose the deb file to install. This is the easiest way to install any program on your Linux Mint because with the double click on the file, you will see a "Package Installer" window; you need to click the "Install Package" button to start installation. 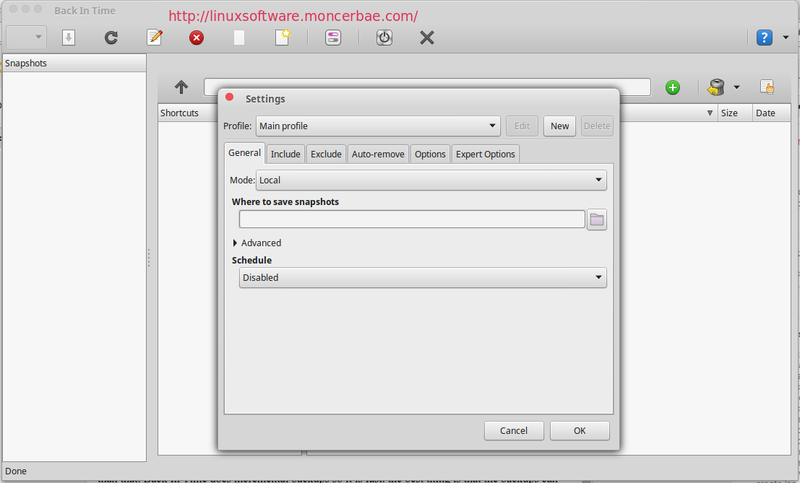 This is the easiest way to install Linux Software on Linux Mint. You have to open Software Manager by clicking Start Menu >> Administration >> Softwrae Manager. First you can search the Linux software via search box or you can browse the Linux Application by category. To install the Software you need an internet connection. Install button will available if you have select a software detail to install. Ways to Split Large File for CSV or TXT on Linux Mint --The text based file contain many rows of data and you can split them into separated file easily on Linux. How you can split large text file into multiple files on Linux let's follow these guide. 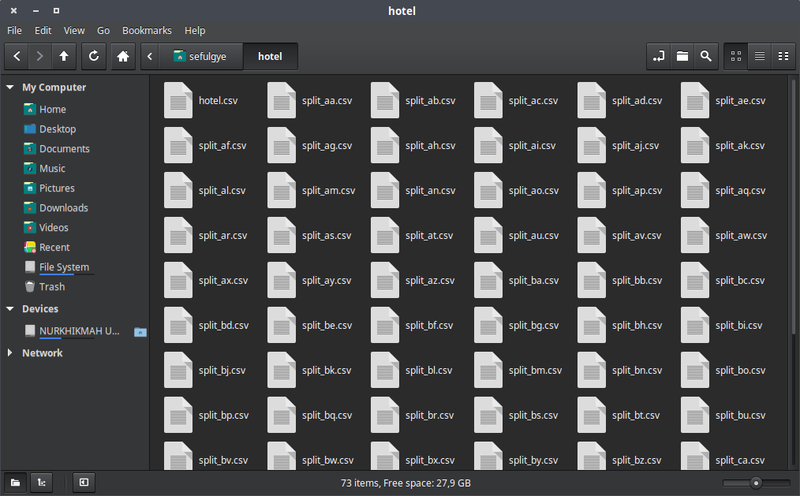 Split a large file into smaller files on Linux can be done with Terminal, the command promt on Linux and you can also Keep Header Row of the file. For an example you have a CSV file which contain around 1000 rows; each row having 5 columns. You want to break this CSV file into 10 CSV files of 100 records each. (Each having same CSV header as present in original CSV). How to solve this case ? Linux has a great little utility called split, which can take a file and split it into chunks of whatever size you want, eg 100 line chunks. However, for CSV files etc, each chunk generally needs to have the header row in there. Unfortunately the split command doesn’t have an option for that. However with a little bit more code you can achieve it. If yuo have CSV file called hotel.csv which contain 1000 rows; each row having 5 columns. You want to break this CSV file into 10 CSV files of 100 records each. Press enter again, for the result you can see the created new file named split_aa.csv, split_ab.csv, ...etc on your home directory. Now you have finished split large text file into smaller files on Linux. The Best Way to Convert Video to Mp3 FLAC OGG Audio on Linux Mint; Do you need to extract an MP3 audio track from an MP4 or FLV video? Do you know that you can convert your media files using VLC player? Okay this is the simple and easy media conversion on Linux. This method also can be used to convert YouTube into mp3 file. Beside of playing any audio and video media, the VLC Media Player also can be used as powerful converter which has graphical application which enables you to convert audio, video, image and document files between all popular formats, using and combining other programs. The goal of VLC Media Player is to play all type of audio also video with many codec included. Because of this Linux software can be used to play any media type, the conversion also support many file type including the conversion video to audio such as mp3, flac and ogg file. To follow this Linux Mint tutorial, we assume you have installed the VLC Media Player on your Linux. You can read install instruction of VLC Media Player Click Here! The "Open Media" dialog will be shown. Select the File tab, click "Add" button to add your video file to be converted later. Then click "Convert/Save" button. Click "Start" buton to start your conversion and wait until conversion completed! This is the best way to convert any video to mp3 or anothera audio file on Linux with very easy using VLC Media Player. 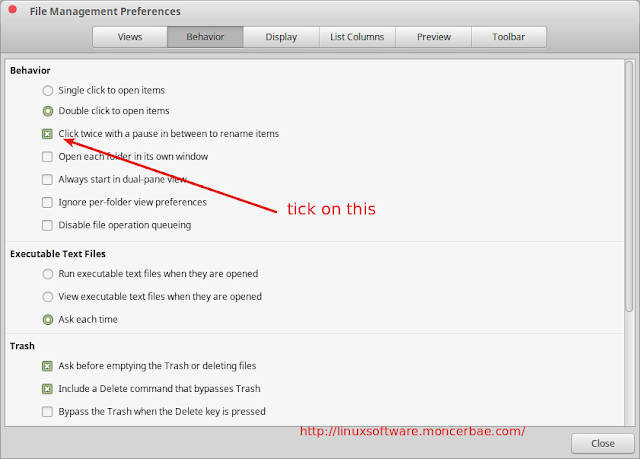 Ways to Rename File on Linux MInt Using Double Click With Pause. 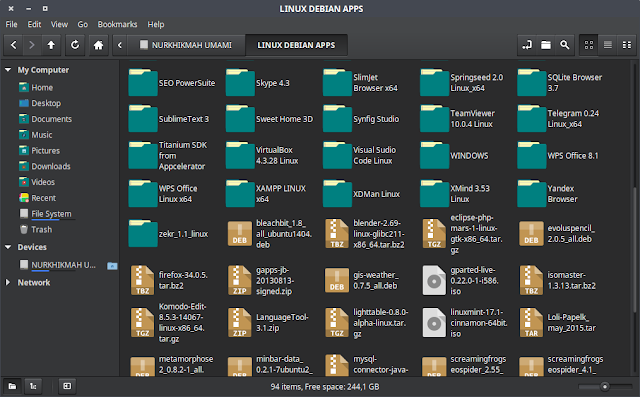 This is Linux Mint Cinnamon file manager preference only. How to configure or enable click twice with pause to rename file or folder? Read it here. Breadcrumbs: Stylable by themes, see src/nemo-styles-fallback.css for default style information. Border radius, color, background color, and text color can be customized through that. If you open your file manager select edit then preferences then select behaviour you can check a box to get double click to rename working. Nemo has a feature called “Quick-Rename”. This feature, which is probably most appreciated by Windows users, consists in renaming files and directories by clicking them, waiting a bit and clicking them again. Quick-Rename is disabled by default. To enable it in Nemo, open your Nemo file manager, go to Edit >> Preferences >> Behavior >> tick the Click twice with a pause in between to rename items. Now, beside of pressing F2 button on keyboard to rename file or folder on Linux, you can also rename your file or folder by click - pause - click again on the file or folder. The result will be the same! Nemo from Cinnamon is amazing file manager. 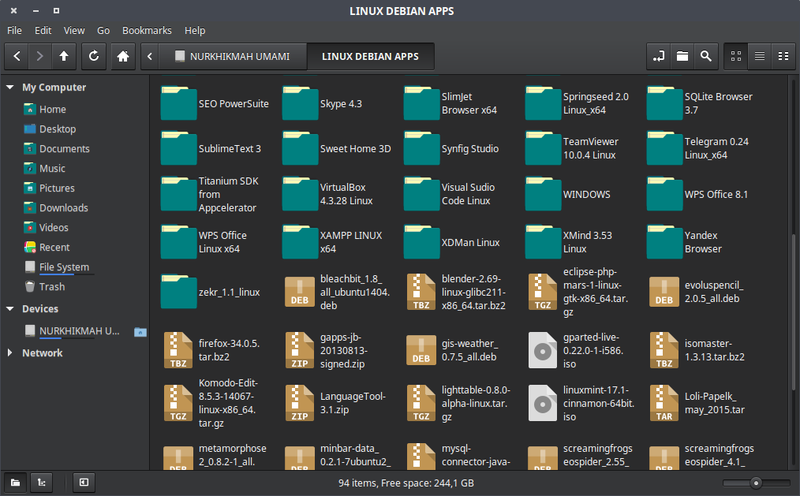 It is better than Explorer and does everything you want in a file manager. Nemo could show or hide the hidden file for you using Ctrl + H short cut. Also you can open multiple tab on Nemo, use Ctrl + T on your Nemo it will add a new tab file browser for you. Have a try! 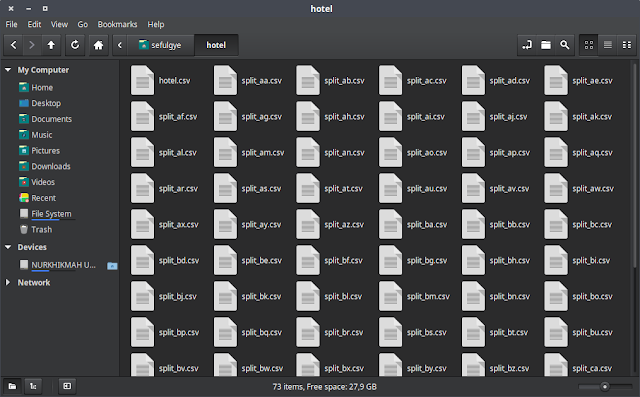 The Nemo file manager is also splitted in two panels: On the left, the most common folders are listed, this can "tree view" or "place view", please see at the left bottom window of Nemo. And on the right, you will see your file and folder. You can copy paste your file here. The Newest version of Cinnamon 2.6, the Nemo copy capability has new look and can handle multiple copy at once! Also Nemo has plugin such as nemo-dropbox that integrates Dropbox. nemo-seahorse which provides you tools for for encryption in GNOME. Moreover , Nemo integrates a zoom button at the bottom that enables you to zoom contents of folder (increase thumbnail size, folder size. See the right bottom window of Nemo! Create Linux System Backup with Back In Time Linux Backup Solution. Back In Time is a simple backup tool for Linux inspired from “flyback project” and “TimeVault”. The backup is done by taking snapshots of a set of directories. Snapshots are a copy of a directory structure or file at a certain point in time. Snapshots are protected from accidental deletion or modification since they are read-only by default. The super-user can delete intermediate snapshots to save space, but files and directories that existed before or after the deletion will still be accessible. Back In Time is a simple backup tool for Linux inspired from “flyback project” and “TimeVault”. The backup is done by taking snapshots of a specified set of directories. Currently there are two GUI available for this Back In Time: Gnome and KDE 4 (>= 4.1). Now we have a backup solution software equivalent to Apple’s TimeMachine on Linux called Back In Time. The alternative applications for Linux to hande Linux data backup solution similiar to the TimeValut and FlyBack. Both of them are discontinue program so the Back In Time is the best backup solution tool for Linux today. What is the Linux Program Called Back In Time Really ? Keep in mind that Back In Time is just a GUI. The real magic is done by rsync (take snapshots and restore), diff (check if something changed) and cp (make hard links). Back In Time acts as a “user mode” backup system. This means that you can backup/restore only folders you have write access to (actually you can backup read-only folders, but you can’t restore them). If you want to run it as root you need to use “su” (command line), “gksu” (Gnome) or “kdesudo” (KDE). A snapshot contains all the files from the selected directories (except for exclude patterns). In order to reduce disk space it use hard-links (if possible) between snapshots for unchanged files. This way a file of 10 MiB, unchanged for 10 snapshots, will use only 10MiB on the disk. When you restore a file ‘A’, if it already exists on the file system it will be renamed to ‘A.backup.<current data>’. For automatic backup it use “cron” so there is no need for a daemon, but “cron” must be running. Starting from version 0.9.24 permissions and user/group are stored in a special file. This way you can even save/restore files from a NTFS/FAT drive without losing this informations (NOTE: FAT don’t support hard-links). NOTE: You can also install Back In Time from Software Center, for Linux Mint user go to Start Menu >> Administration >> Software Manager then type and search backintime, you will find it the install. But please note if you install from Software Center, you will get an older version of this software. This is the best backup tool for the Linux system such as restore point on Windows but it is more than that. Back In Time does incremental backups so it is fast. the best thing is that the backups can be viewed with just a file browser (including older snapshots) so when disaster strikes, there is no complicated installation and configuration required to access the backups on another computer / the repaired computer.